The time was a remarkably mild autumnal early Friday evening; the setting was the Victoria Nasjonal Jazzscene, the jazz club in central Oslo. (The Norwegian Ronnie’s, I was told, though Ronnie’s didn’t get financial assistance from our government the last time I looked! ); the occasion was the launch of a book about Norwegian jazz - written by an Italian. Luca Vitali, a jazz journalist from Bologna and one of the curators of that city’s Angelica Festival, first started visiting Norway in the early 2000s. What he heard excited and enthralled him to such an extent that in 2013 he published Il Suono Del Nord, 250 pages of interviews with Norwegian musicians and reflections upon the scene there. Now, thanks to assistance from the Norwegian Ministry of Foreign Affairs and Norsk Jazzforum, together with support and editing from UK radio presenter and fellow promoter of Norwegian music Fiona Talkington, we have that book in English: The Sound Of The North: Norway And The European Jazz Scene. Both books are published under the Italian imprint Auditorium. 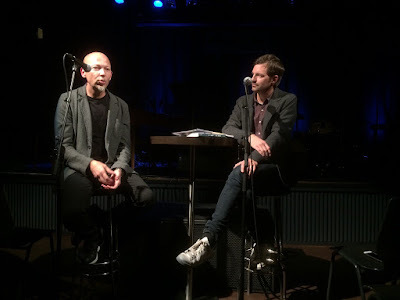 The launch was to have centred on a chat between Luca and his English editor, but as Fiona couldn’t be there her place was taken by Rob Young, former Wire editor, now editor of Norway’s sole jazz magazine, Jazznytt. What was the first Norwegian music Luca had heard? The defining musicians from the “first ECM era” - Jan Garbarek, Terje Rypdal. Then, as the second millennium became the third, Nils Petter Molvær’s Khmer, Bugge Wesseltoft’s New Conception of Jazz, and the early manifestations of Jaga Jazzist. The difference of the setting and the history was important, Vitali stressed. “If you were born in New York you had a kind of jazz identity; if you were born in Molde it was very different. Norway had a really vital importance in the European jazz scene because it emancipated the music from its Afro-American roots. Vitali was also interested in the society behind the art, and the influence that has had. As we had coffee together the next morning he referred to music as “the Norwegians’ second oil” - an indication of how important it was to their economy, and why the government was so supportive of the culture. He also contrasted Norwegian society with that of his own country. While apologising for “my poor English” he nevertheless came up with strong verbal images: “There are a lot of stairs in Italy,” he explained. Was he referring to the Spanish steps et al? Ah, no. “Norway is a flat society,” he said. And “there are no frames around things”. Luca Vitali is a lovely man to talk to - generous with his time, bubbling with enthusiasm, selfless in his dedication. It’s not only the music of Norway that excites him - he wrote down for me the names of some Italian musicians I should hear, as well as Norwegian bands he liked - but that the jazz that has been made over the last 50 years in this large Scandinavian land with such a small yet hugely creative population has a special place in his heart there can be no doubt. There are 250 pages bursting with that love. All those words were verified by the performance which followed the launch. 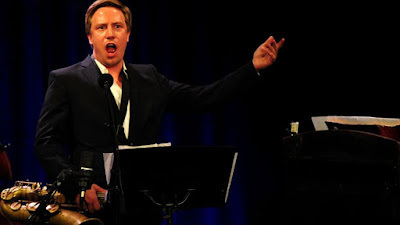 The tenor saxophonist turned operatic tenor Håkon Kornstad turned in a blinding set with his quintet. There were no frames here, eclectic influences brought together with complete coherence and integrity to create something thoroughly original and totally compelling. His performance marked another launch: that of his new album Tenor Battle (Jazzland). A packed Victoria loved it, celebrating with the customary synchronised clapping and calling him back for encores. Peter Bacon was a guest of Music Norway.